There is a name, the hand of a woman in that space designed for relaxing and located behind the famous Iglesia del Santo Ángel Custodio de La Habana. Is not Cecilia. 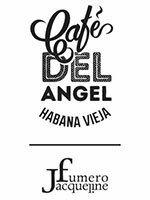 Jacqueline Fumero, the fashion designer, is in charge of everything in Café del Ángel. This cafe she puts all her effort in, proposes you new delights, Mediterranean recipes, the ideal preparatios for the day you decide to discover this woman hand, this brand coming from fabrics to kitchen with the same passion. This you will carry in your memoir of your time in this wonder city.